The strongest storm door in the industry is a Keystone Doors Storm Door. Storm doors of lesser quality can dent, warp, hang crooked, and slam shut. Our Storm Doors won’t do any of those things because they are engineered with innovative features to make them stronger and more durable for everyday use. Your Keystone Storm Door will outlast the others, long into the future, because of these features. 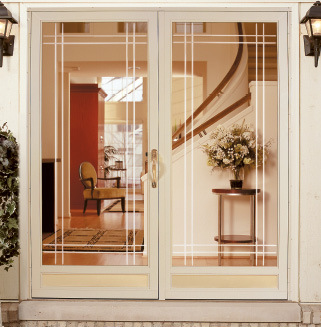 Keystone window offers a wide variety of storm door styles and etched glass. We even offer you double door configurations. Styles include full-glass, half-glass, and self-storing storm doors. We use safety glass in all our doors and use heavy duty aluminum screens that put the competition to shame. Heliarc-Welded Corners are the foundation of every StormWeld™ storm door. Unlike conventional doors with screw-type corners, StormWeld™ corners are the strongest spots on the storm door, giving you maximum strength and durability. Our Exclusive Interlocking Hinge System is a “guaranteed not to fail”, four-hinge tubular design which interlocks into the door frame. It eliminates any tendency of the storm door to pull away from the frame, which traditional hinges don’t prevent. Bronze bushings, held in place with heavy steel pins, provide extra durability. StormWeld’s Brush-Type, Adjustable-Bottom Weather Seal is similar to the type of weather seal found on many commercial storm doors. With its nonshrink design, it won’t bind, twist or tear as most traditional vinyl sweeps do. It costs us a little more, but it’s worth it! StormWeld’s Adjustable Hydraulic Closer will provide you with many years of smooth, non-jarring closing action. Our Auto Hold Option is great for those days when you’re carrying groceries in or moving something out and don’t have an extra body available to hold the storm door for you! Durable, Lockable Handles are a standard feature with all StormWeld storm doors. We also offer a variety of optional handle styles for a customized look. 17 Color Choices are available using the most durable color-coating system in the United States. It will keep your door looking better longer than any other finish.